3. 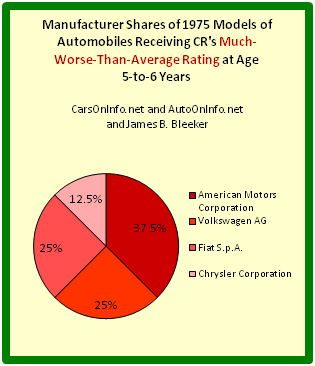 A pie chart depicting manufacturer shares of CR's Much-Worse-Than-Average reliability rating. The overall reliability ratings of models of cars (and trucks) at age range 5-to-6 years are used in the histograms and pie charts in order (1) to provide a graphic depiction of the differences in how well cars hold up over a longer period and (2) to help identify which car manufacturers have made and currently make vehicles with greatest durability and least durability. 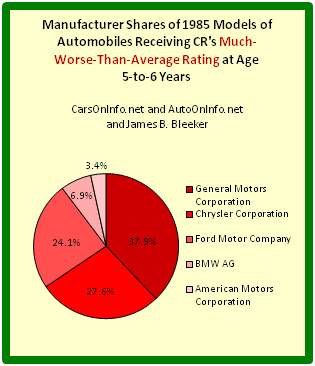 The model years 1975, 1980, 1985, 2000, and 2005 are selected to give good historical perspective on these differences and to offer insight on changes over time. 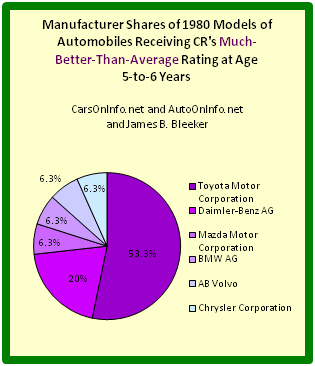 Model years 1990 and 1995 are omitted as Consumer Reports did not offer overall reliability ratings for these model years for the age range 5-to-6 years. 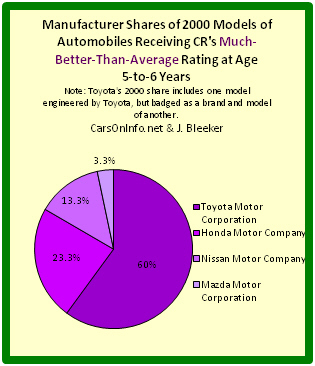 The histograms and pie charts are grouped by model year. 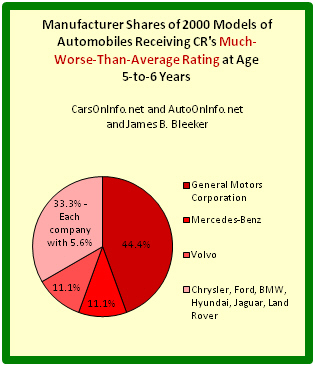 The share of Average autos (middle bar) shrunk dramatically from 1975 to 2005, and in 2000 and 2005 the relative frequencies of CR's overall reliability ratings had dual nodes. 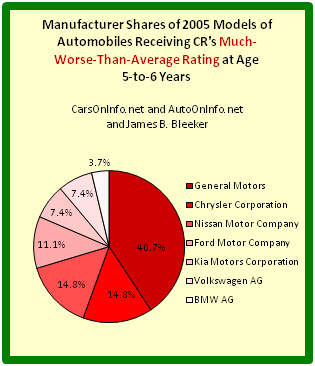 This suggests that careful selection of a motor vehicle may be even more important today than in times past. 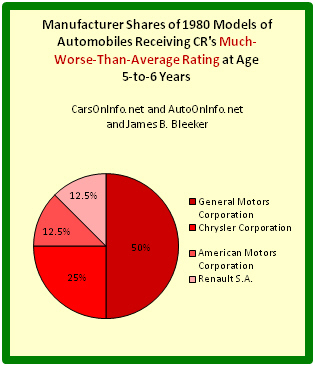 In 1975, General Motors Corporation had no model among the worst, but by 1980 it dominated the worst and maintained that dominance to 2005. 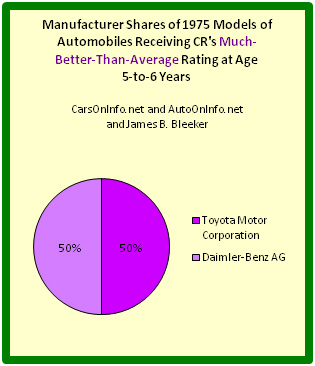 From 1975 to 2005, Toyota Motor Corporation's share of the best automobiles increased from 50% to 59.4%. 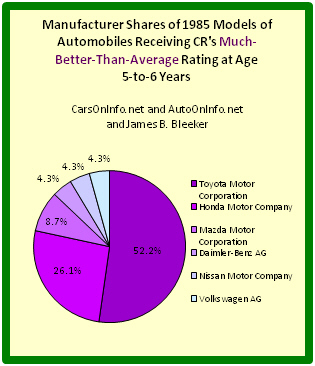 In 1975 and 1980, Honda Motor Company had no model among the best, but from 1985 to 2005 it accounted for more than 20% of the best automobiles.